The field of the flag of Los Angeles has three vertical stripes of green, yellow, and red divided by zigzag lines (known heraldically as “dancetty”) on each side of the center stripe. On a field 26 units wide, the stripes have a proportion to each other of 6:12:8 at the top and 8:12:6 at the bottom. Centered on the yellow stripe is the city seal, 7 units in diameter. A white (or silver) ring surrounds the seal, its outer edge beaded in white with black circumferences, its inner edge beaded with 77 solid black beads, alternating one large to ten small. Centered on the top half of the ring clockwise from 10 to 2 o’clock is CITY OF LOS ANGELES; centered below, running counterclockwise from 7 to 5 o’clock is FOUNDED 1781, all in black. The field of the seal is a yellow disk with a quartered heraldic shield. The first quarter is an American shield (6 over 7 white stars on a blue chief, and 7 white and 6 red vertical stripes below). The second quarter is the California bear flag without any lettering. The third quarter is a bald eagle, facing the fly, but otherwise in the pose of the Mexican eagle with a serpent in its beak, perched on a nopal cactus. The fourth quarter are the arms of Castile and León, a gold castle on red on the hoist side, a red lion on white on the fly side, divided vertically so that León’s portion of the field is slightly wider than Castile’s. In the position of the dexter supporter is a spray of olives; above in the crest position, a spray of grapes; and in the sinister supporter position, a spray of oranges, all in natural colors. The lion of León and the castle of Castile are from the Arms of Spain and represent Los Angeles under Spanish control from 1542 to 1821. The sprays of Olive, Grape and Orange suggest the location of Los Angeles as a City set in a garden. The beaded circle surrounding the shield represents a Rosary suggesting the part played by the Mission Padres in founding the city. The flag was presented to the city by the La Fiesta Association in preparation for the city’s sesquicentennial anniversary celebration. The seal had been officially adopted on 27 March 1905. Flag adopted: 22 July 1931 (official). Roy E. Silent and E. S. Jones, residents of the city. I have a post card image that is said to date from 1907. The flag is a vertical tribar of red, yellow, and green with a large white L on the red stripe, and A on the green stripe. A black bell with 1781 in white superimposed over a bunch of purple grapes is on the yellow stripe. I queried the Los Angeles Public Library about this flag. The answer, from Michael Holland, says, "There was no official city flag prior to 1931, but there had been an attempt to create one in January 1926. The request was placed in files and never enacted.... As to the origins of the postcard, the only explanation that comes to mind was that some individual or group may have been trying to build support for a flag as a result of the Seal appearing two years earlier. There were no official attempts by the City of Los Angeles according to the Council Files and indexes at any time before or after the suggestion of 1926." The 1781 indicates the date when Governor Felipe de Neve visited the future site of the new pueblo to clear the land and mark it off. 44 men, women and children began life at the new pueblo - El Pueblo de Nuestra Senora la Reina de Los Angeles de Porciuncula (Sept.4). Only two of the original settlers were white Spaniards. The other settlers were of Indian, Mestizo, African and Mulatto descent. Twenty two were children. The flag shows the bell, presumably to honor the already existing missions established by Father Junipero Serra and his associates and bunches of grapes to signify the first industry of the area - winemaking. Just one year later Father Serra dropped in on the community and scolded inhabitants for their lack of the moral backbone - he found most of them drunk. During the closing ceremonies of Olympics (summer & winter) the protocol indicates that the flags of Greece, the host country and the next Olympiad host country's city are raised. 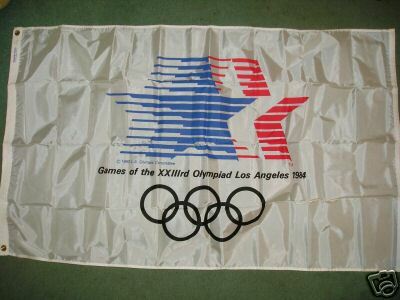 Well, in the closing ceremonies of the 1980 Moscow Olympics and due to the U.S. boycott - in substitution of the American flag the Los Angeles city flag was raised with the Greek and Soviet flags.